Our Oakville custom furniture collection has seen this beautiful addition added to it. This custom one-of-a-kind live edge walnut hutch has perfectly mitred corners. The live edge profile runs down both sides of the furniture unit in a stunning waterfall design that allow continuity from all angles of the piece. 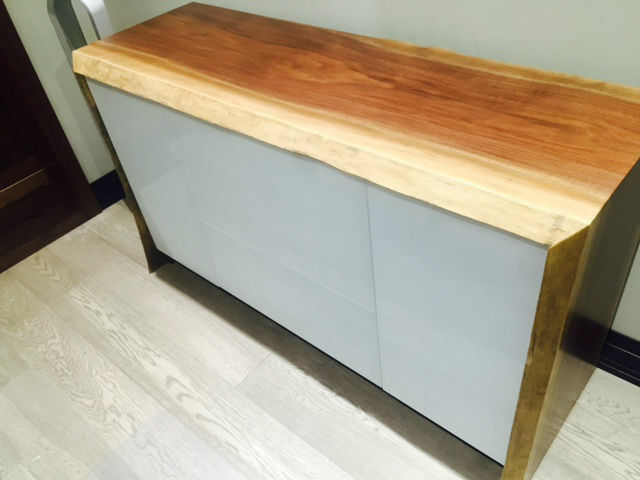 The wood is offset with white glass pull-out drawers and cabinet doors. The glass shelves are frameless for a very contemporary look. Talk to us about your next custom furniture project or just stop by our Oakville showroom to discuss your custom furniture idea.